There's a line from the Kris Kristofferson song Sunday Mornin' Comin' Down that springs to mind today: "No way to hold my head that didn't hurt." Ireland knows where you're coming from Kris. The realisation that Ireland will have to do a little bit more than just show up is rapidly dawning on a nation who were certain of victory before Saturday's clash. The ATGs - All-Time Greats - were certain too. ROG said we were taking England far too seriously, BOD said only one of them would make our team and Strings said Owen Farrell was a hothead. There was a touch of the old GAA piseog of organising the victory dance the week before the game. England couldn't have been better motivated by us and the hurt showed. The bookmakers priced Ireland at 1/3; even they were taken in by the love-in. I met Quinny in the lift on the way up to the press box. He's the smartest of the lot. "I have a bad feeling about this," he said. "I think they are going to beat us." The stadium was as empty as a church on the day the slow priest says Mass. Then at about 10 minutes before kick-off the flames shot up and the drumroll gave notice the teams were about to run on to the field. Someone should have shouted 'time gentleman please' or 'have ye no match to go to?' because when the players arrived there were only about 10,000 in the stadium. England got as big a cheer as Ireland. It must have been some downer for the Irish players and we got off to a terrible start. The picnic people spent too long in the bars. The picnic people who waited on for the jelly and ice cream should be ashamed of themselves. I know of so many who would have loved a ticket and every man and woman among them would have been there to cheer Ireland on to the field of play. Instead it was Ireland of the 10,000 welcomes. England were by some way the better team. They were bigger and hardly any Irish player came off best in the collisions. There was little, if any, go-forward from our big ball carriers. Our back-row were dominated at the breakdown. England copped on to our tactic of tackling low to bring the ball carrier to the floor. The plan was for an Irish player to get in first, but England always had an extra, more powerful man there and they knocked us back. We hadn't even one turnover on the ground. The worrying thing is so many players seemed to lack energy. It was as if a punishing November and the beating of the All Blacks was really the focal point of our season. Then there was the January madness between Munster and Leinster. The players took that game far too seriously. You would swear it was Manchester United versus Liverpool. The Irish players played that game with far more intensity than Saturday's match. Jonathan Sexton got all his kicks and was good most of the time, but he needs games. Conor Murray (below) has had no pre-season and he will also have to play more rugby. Keith Earls was injured, Rory Best's legs were gone a long way out. Peter O'Mahony and CJ showed signs of wear and tear as the game went on. Ireland did not hunt as a pack. The Irish cause was not helped by some atrocious work from the officials. You will not believe what I saw. Sexton was pinned, with his hand being held as tightly as a mother bringing her little boy across a busy road. Sexton tried to break free, but the vice was too tight. He appealed to the touch judge, who was all of two metres away. The touch judge actually tried to pull the English player's hand away, but he failed. England scored and there was no call-back for an Irish penalty. Shocking stuff. At one point in the first-half Murray was held back off the ball by Jack Nowell and there was a dangerous high tackle from Maro Itoje on Keith Earls who was hurt. No cards then, when there should have been two in 10 seconds. Henry Slade's try put the game out of our reach. He was in front of the kicker, but the TMO adjudged otherwise. A possible forward pass was kept off the charge sheet. Ireland were roadblocked most of the time in the chase for the high kicks. But for all that, England were the better team. They just wanted it more. Their hurt at being dismissed and joked about showed. 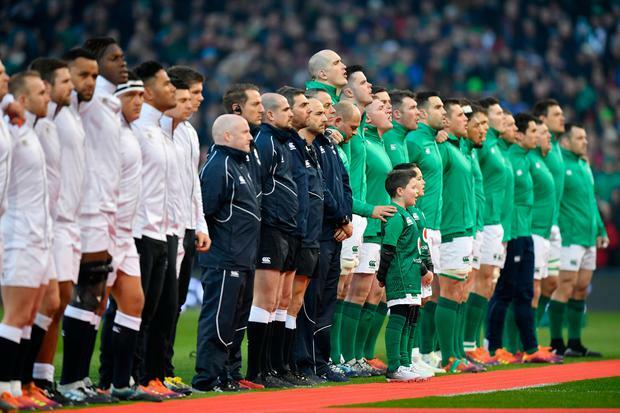 This game came too soon for Ireland - and so does next week against the Scots. I would not write off this Irish team, but the season so far did not fall right for us. Could it be we were thinking about the World Cup somewhere deep in the recesses of the mind, even though you can be sure Joe called it as one day a time? We have learned our lesson now and these players who have brought so much honour and glory to our country are men enough to come back from this beating. They have been through so much together and together they will get the Joe Show back on the road.